“Something’s not right.” Amazon has just released a new trailer and the premiere date for season two of Goliath. Season two of Goliath premieres on Amazon on June 15th. 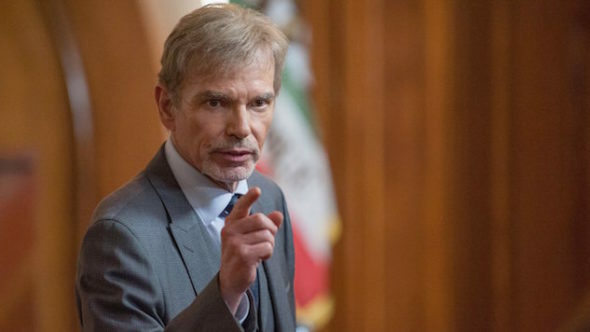 SEATTLE — May 2, 2018 — (NASDAQ: AMZN)–Amazon Prime Video today announced the second season of its Prime Original series Goliath, starring Golden Globe winner Billy Bob Thornton, will return on Friday, June 15. Thornton will reprise his role as Billy McBride who, after winning a huge verdict in the Borns Tech case, is reluctantly pulled back into the law when his friend’s 16-year-old son is arrested for a double homicide. However, as Billy, Patty (Nina Arianda, Florence Foster Jenkins) and the team start to investigate what appears to be an open and shut murder case, they begin to untangle a deadly conspiracy in the seedy underbelly of Los Angeles, where drugs, real estate and politics intermingle. Once again, Billy finds himself facing a new Goliath, one that is as formidable as the city’s mayoral race and as tall as the skyline itself. Thornton won the 2017 Golden Globe for Best Actor in a Drama Series for Goliath’s first season. What do you think? Have you seen Goliath? Will you watch season two? I thought season 1 was better but I dont think this storyline was as bad as some are writing. My biggest problem is get a new sound editor. So much music over dialogue….had to rewind parts to figure out was being said. Actually just lose all music when dialogue is going one. It happens a lot in movies now too. People making this ever watch it after lol….Good god, overly done.